Editor's note: Pete Heley's outdoors column was severely trimmed for space reasons on the sports page last week, here is the complete column. Crabbers wanting to use the crab dock just upriver from the Siuslaw River’s South Jetty, need to be aware that the road is closed for repairs near Beach 5 Day Use Area — which is about a half-mile before the crabbing dock. Crabbing is definitely slowing down at Charleston and Winchester Bay, but is still somewhat more productive than it is at this time in most years. There were no scheduled trout plants for this upcoming week for our area. Legal rainbows were stocked this week in Alder (566); Cleawox (1,332) and Dune lakes (332). Munsel is the only Florence area lake stocked this week with larger rainbows and received 500 15-inch trophy rainbows. Anglers fishing Eel Lake this winter have been catching fair numbers of small coho salmon that chose to remain in Eel Lake rather than swim down the Eel Creek outlet on their way to the ocean. Extremely low water in Eel Creek probably had a lot to do with them staying in the lake. These fish have been running eight to 14-inches in length and many anglers have been keeping them. When I asked Mike Gray, an ODFW biologist stationed in Charleston (who seems to have memorized the fishing regulation booklet) about these fish, he quickly pointed out to me that these fish were not legal to keep — for a couple of reasons. First, they were not finclipped and Eel Lake was not mentioned under exceptions to the southwest zone and second, They didn’t measure 15 or more inches in length, and once again, were not mentioned under zone exceptions. Young coho planted in Cooper Creek and Galesville reservoirs are legal to keep and are to be considered part of the five trout daily bag limit — and both these waters are included in the exceptions section for the southwest zone. I found it very interesting that Bill Taylor, a STEP volunteer living in Winchester Bay, had a scale sample analyzed from a 13.5-inch Eel Lake coho by an ODFW biologist this winter and that fish was found to have spent some time in saltwater. Perhaps that 13-inch coho I caught on a plastic worm a decade ago during early August on Tenmile Creek near where Eel Creek enters wasn’t as unusual as I thought it was. Northern California’s Clear Lake recently held a crappie tournament that was wildly successful. Entrants were allowed to weigh in a maximum of 10 crappies, all of which had to measure at least 12 inches in length. The tournament had a full field of 50 boats and the tournament winner weighed in 10 crappie weighing 21.42 pounds — or slightly more than 2 pounds and 2 ounces per fish. A very impressive average since the heaviest crappie caught during the tournament only weighed 2 pounds and 8 ounces. Local anglers should pay special attention to Saturday, Feb. 23, as two special events will occur then. The “Flyfishing Expo” will be held at the Reedsport Community Center at 451 Winchester Avenue in Reedsport from 9 a.m. until 3 p.m. This is one of the more ambitious events put on by a single flyfishing club every year. The event will feature free door prizes and raffle drawings. Meals and snacks will be available and some of the booths will feature fly tying; fly casting; informational and equipment displays. There are plenty of varied flyfishing-related things to experience and best of all – it’s absolutely FREE! The other big thing that day will Tenmile Lake’s annual “Frostbite Open,” which is one of the Northwest’s largest and most popular bass tournaments. This tournament usually fields the maximum 75 boats and the winning weight for a five-bass limit usually tops 20 pounds. Recent cold weather and the resulting low water temperatures could severely test the anglers participating in this year’s tournament. However the anglers have passed similar tests during the tournament in previous years. People wanting to check out both events should check the Flyfishing Expo first and then check out the Frostbite Open weigh-in which usually occurs around 3 p.m at the boat ramp in the Osprey Point RV Park in Lakeside. Oregon recently lost one of its most accomplished outdoor writers with the passing of Dwight Schuh at age 73 after an eight-year battle with cancer. 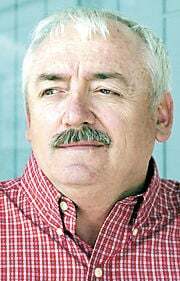 Dwight was born in Corvallis, but was living in the Klamath Falls area when he began his outdoor writing career.